Dolls, in the left corner take a peek at Casadei’s charming 6471 T-Strap Platform Wedge Sandal; to the right prepare to be amazed by Vince Camuto’s beautiful Babe. While Babe features a lower heel and platform, and is offered in a Canyon Brown / Chocolate Mousse hue, as opposed to the navy color of the Casadei; for just $159.00, in comparison to the $960.00 price tag of the ultra-covetable Casadei, Babe is the perfect compromise for the frugal fashionista, and allows one to scoop up both snazzy shades (Canyon Brown / Chocolate Mousse and Black)! I like the brown. I'm for Babe! Awesomeness! Love the Babe from Vince Camuto! Vince Camuto might even be more comfortable too. Definitely a great steal! And bonus! Vince C.'s shoes are very comfy! those are lovely..
Super cute! Its almost a perfect match. That would look lovely with a vibrant pleated maxi skirt!! i think i like the blue one. but they look so alike, i don't really care anymore. LOL. it's crazy how similar they look. I actually liked the brown pair much better before the price tag! I love the Vince Camuto shoes. Definitely a great find. 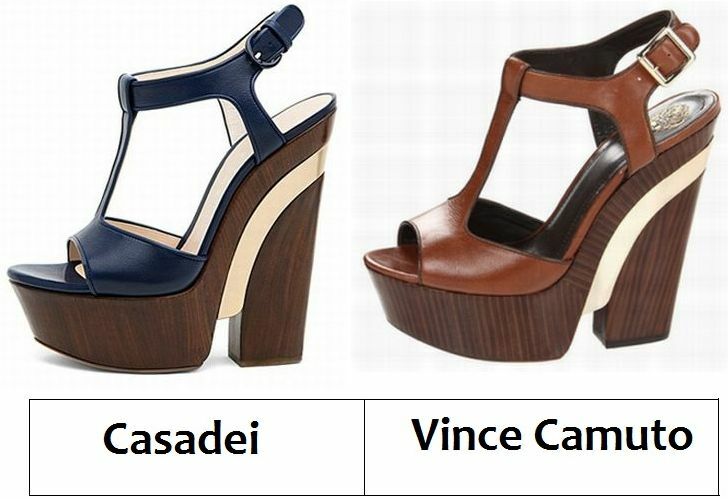 I prefer Casadei. I adore the blue leather, and the gold strip in the wedge. That's what makes it special. So fantastically polished! OMG! Seriously completely identical. But, I may be partial to the blue leather ... but what a great deal! Great match! Those would be a great statement piece for summer. hmmm difficult to choose I love both! but i'm leaning towards casadei! I actually like the Vince ones better! Is that weird? Whenever you do these I always want both. Ha. The thrifty pair is pretty cute though. I love the elegant shape of the Casadeis! Wow! Those shoes are just awesome - I love them in brown. I love that block heel! I need a pair like that. I just fell in love with those shoes! They both are a great shoe for the summer! too bad the one I really like is the blue of Casadei but the price is another money I can save for an international trip this year. they are both gorgeous, esp. the Camutos. i just bought some Guess platform wedges over the weekend!